Featured in the picture is the interior of a Chinese sleeper train. I traveled twice on one of these trains while visiting China this month. 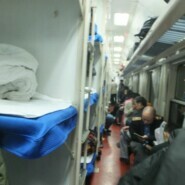 While the space is cramped, the train was quite clean and ran smoothly. I shared one of these cubicles with six men. Some of them snored but were polite and friendly in spite of the language barrier. However our pantomimes were eloquent. At intervals an attendant moved through the train with a cart of soup or fresh fruit. The train was on time. Most of the travelers were businessmen. There were few women aboard. The bathroom was as you would expect. Smoking was allowed on the platforms between the cars. I found the experience revealing and felt that I was understanding the Chinese people. Many of them were pensive and silent, gazing out the window or lying down on the narrow beds. A down comforter and pillow was furnished with each bed. I snuggled under mine and read. The trip was pleasant.